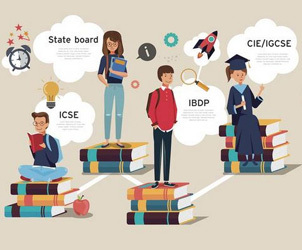 International Baccalaureate (IB) Board: What? Why? Welcome to Mount Litera School International (MLSI), a leading IB school in Mumbai which offers a holistic curriculum to make your child a future-ready global citizen. Established with the vision to provide outstanding world-class education, we create a nurturing environment for our students where they can explore and develop their emotional, physical, creative and intellectual skills. We recognize and appreciate that each child is unique and will have the freedom and courage to pursue their dreams, while we gently guide them to achieve their maximum potential at school. Our students are happy and confident, respecting themselves, each other and the world around them. The inquiry-based International Baccalaureate curriculum at MLSI focuses on developing conceptual understanding, critical thinking and developing 21st century skills. With a fully integrated approach, as a growing IB continuum school, our children begin their learning journey with the Early Years. They then experience a trans-disciplinary approach through the Primary Years Programme which nurtures and develops young students as caring, active participants in a lifelong journey of learning. We offer the Middle Years Programme, a five year challenging framework that encourages students to make practical connections between their studies and the real world. We are a candidate school for the IB Diploma Programme, which will be a High School Diploma, preparing the students for a world-class university education. Our team consists of passionate and dedicated educators at MLSI who believe in the abilities of our students and commit to preparing them to take on the world. We see ourselves and parents as partners in this journey to provide a meaningful future for each child. I look forward to welcoming you and your child to MLSI, a school which truly cares and believes in making children future-ready! Our association with MLSI goes back to four years ago when our elder daughter started EY3. Soon after, our younger one also became part of the MLSI community. Looking back at the past four years we can say without a shadow of doubt that as parents we made the right choice for our kids. 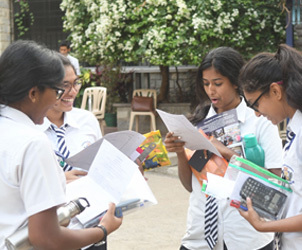 MLSI has indeed lived up to our expectations and provided a secure, friendly and sound environment for our girls to flourish academically, socially and holistically.The school ticks all our boxes in terms of the dedicated teachers, IB method of teaching, parents involvement and a supportive management. The state of the art infrastructure, modern resources and equipments along with excellent staff and very good bus transport makes MLSI stand out amongst the rest. The multitude of ways of teaching and learning keeps the students engaged at all times. There's nothing more delightful and reassuring to hear when your child gets back from school and says "mama can I go back to school". 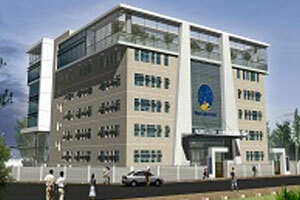 In a nutshell, the culture and teaching method at MLSI is excellent and the right moral values are being inculcated. Thank you to all the staff and management for doing such a wonderful job. I remember the first time I walked in as a parent of an NRI kid. 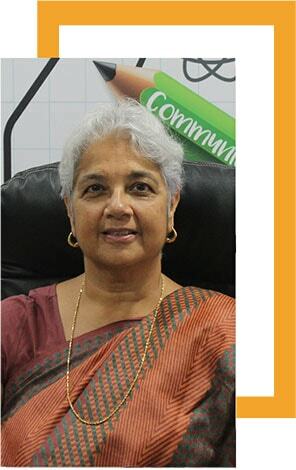 My primary concern was to inculcate our values in early years of her childhood. I thank MLSI for instilling in kids our history and culture while teaching them to appreciate history and cultures of others through various programmes like Cultures Mela and celebration of other festivals too. You make a tremendous impact and difference in my daughters life everyday. 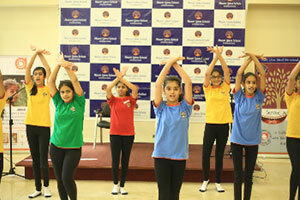 MlSI took up every challenge raising the bar academically, while meeting students' social and emotional needs. The efforts are the foundation on which the nations future rest. Deepest Gratitude to the educators who walked into the classrooms with the goal of motivating, inspiring and nurturing the minds and hearts of children with care. For teachers I would say 'You may be just a teacher for the world, but you are a star for my Jjia. Deepest Gratitude to Principal, teachers, study group members, security, cleaners, nurses and the cooks too. For me a school is successful when your kid wakes up happily every morning and waiting to head for school cheerfully. A warm, close knit community of teachers, mentors, friends, parents and bright young minds; Mount Litera School International is Khushi's second home. A young girl in her pre-teens, our daughter Khushi is at her most creative and most impressionable phase of life. We recognised the need to create a space for her that would nurture her talents and shape her into a responsible, conscientious citizen. Bearing this in mind, we commenced on our search for a school that would be well suited to our needs. A few visits, meetings with faculty, interactions with students and chats with parents was enough to convince us that MLSI is the best fit for Khushi. We are now proud members of the MLSI family. As parents and stakeholders, we are glad to have found an ecosystem for Khushi that goes well beyond the basics of what a school must be. From its world class faculty, its exciting array of extracurricular activities to its emphasis on values and community engagement and participation MLSI never disappoints. Our school cultivates the spirit of enquiry, adventure and exploration in its students in a safe and friendly environment. There is mutual respect and a culture of competence, integrity and compassion. While students are held to high academic standards, they are also taught empathy and responsibility. 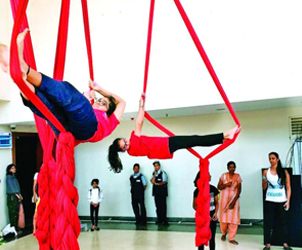 Here they are offered some of the most sought out extracurricular activities, like aerial silk, robotics and carpentry. Every morning we are heartened to see Khushi go to school with a smile on her face. As parents, there is no greater joy and comfort than seeing our child thrive in an ecosystem where excellence, creativity, and integrity are held in such high regard. MLSI was our first choice because of the diverse curriculum it offers. They emphasize on creativity, art and sports, giving our child a chance to explore skills and passion inside and outside the classroom equally. The school has a welcoming atmosphere and it is quite evident that all the staff know the children well. I am actively engaged in my child’s education as the teachers are easily approachable. I have seen positive changes happening in my child. She is more confident now and attempts day to day challenges independently. As parents, we are quite confident about MLSI’s ability to lay the foundation for my child’s future and career choices. Thanks to the innovative methods of imparting education at Mount Litera School International which encourages learning without boundaries. 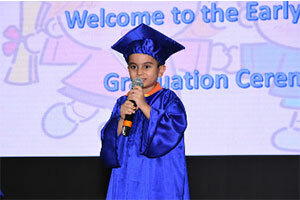 My child Ayan has progressed to learning about subjects well beyond his age. The Teaching methodology has inculcated a desire to know the “Why” of everything and the rote-learning approach is virtually non-existent. In the last two years, Ayan has grown to being a very confident, intelligent child and has also developed talents in art, drama and music. Even at this young age, he enjoys non-fiction books on all subjects - something which his teachers have identified and encouraged to the fullest! I am thankful to and proud of my association with Mount Litera School International. As founder parents at Mount Litera School International we have experienced the school's commitment to deliver a high standard educational experience from the very first day. The board, teachers and faculty have always been dedicated at maintaining this vision throughout, which alongside the IB program and campus infrastructure has provided a secure, pleasant and intellectually simulating learning environment that our child looks forward to each day. Our most important resource is our dedicated team of educators who strive to implement an enriching curriculum that embraces core academics, development of character, a broad exposure to Arts and Physical Education. MySchoolOne is a one-stop access solution for all of the MLSI community needs, with its enormous and robust functionalities – it has been implemented to allow parents and teachers to access information concerning your children and other essential school information.